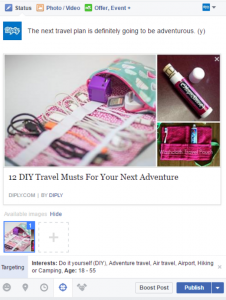 Post contributed by #SMWiTO sponsor and partner, Diply. Over the past few years, declining organic reach has become a major issue for publishers using Facebook. So, how do you get more organic engagement for your posts? As most of you would know, early this year Facebook added a feature that lets you specify the audiences that are most likely to engage with each Facebook page post, based on interests. I’ll show you how to use the new Facebook Audience Optimization feature to increase engagement for your Facebook page posts with specific audiences. Why Use Facebook Audience Optimization? Facebook takes hundreds of things into account in their algorithm to determine whether someone will like and engage with a post from your Facebook page. Using Facebook Audience Optimization will help Facebook’s algorithm determine the right audience for your posts. It will allow you to tell Facebook who should not see your post. For example, if you know you’re about to post something that will receive a negative reaction from men, you can restrict the post to be shown to women only. 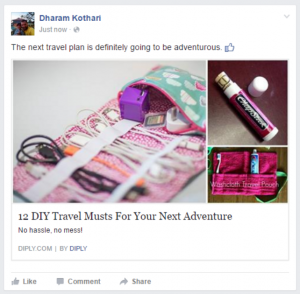 It will allow you to learn more about how people with specific interests engage with your posts. If you knew that your fans who are interested in adventure sports are the most engaged with your posts, you would know to post more about adventure sports for better engagement. Facebook specifies that in tests, Audience Optimization doesn’t increase the organic reach of your Facebook page posts. But it does increase engagement. Theoretically, without Audience Optimization, Facebook will show your post on a specific topic to a random 5% of your fans, some of whom may or may not be interested in that topic. This can result in low engagement. With Audience Optimization, Facebook may be more inclined to show your post on a specific topic to 5% of your fans who are interested in that topic, based on your specifications. This would ideally result in better engagement. And of course, if more people engage with your posts because they match their interests, your posts would start to appear in their news feeds more often due to their engagement. So it could result in a boost in organic reach over a period of time. This feature is currently rolling out to English-language pages ONLY in select categories, such as the Websites > News / Media Websites category. To see if it’s available for yours, go to your Facebook page’s Settings. 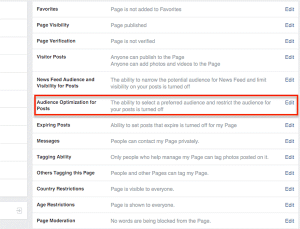 Look for Audience Optimization for Posts in General Settings and click the Edit link. Once enabled, you can go to your Facebook page’s update box and see an icon for Facebook Audience Optimization. 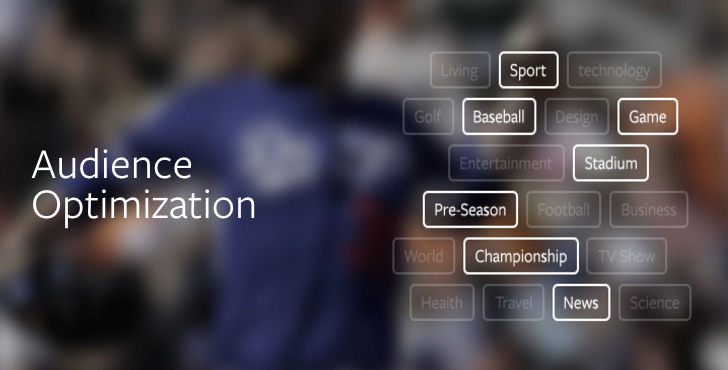 Next, configure your Preferred Audience by telling Facebook about the audience’s interests. These are the same interests you would find when targeting an audience in Facebook Ads. As you type in interests, Facebook will show those it thinks you’re targeting. Facebook will also let you see your estimated reach for each interest. Your Preferred Audience interest selections will not limit the people who can see your post, but rather will tell Facebook that this is your preferred audience to see your post. 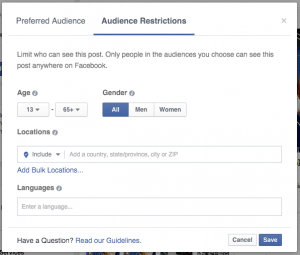 You can optionally configure Audience Restrictions to tell Facebook who not to show your posts to. When you’re finished, click Save. Your post should look like this. After you hit Publish, you will notice that where you normally see the globe icon to indicate public visibility, you will see a settings wheel icon instead. When you hover over it, you will see the Audience Optimization settings you configured. After you hit Publish, you will notice that where you normally see the globe icon to indicate public visibility, you will see a settings wheel icon instead. When you hover over it, you will see the Audience Optimization settings you configured. People who are not admins of your Facebook page will only see that it’s set to Public in the visibility settings. 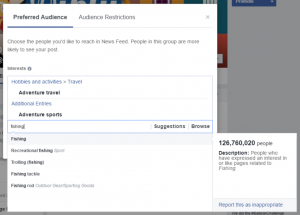 Preferred Audience and Audience Restrictions settings are currently only available on the desktop browser version of Facebook, select third-party social media management tools like SocialFlow and Sprinklr, and tags for Instant Articles. To find out how specific audiences engage with your post based on interests, visit your Facebook page’s Insights. You should see your post with a special icon under the Targeting column to indicate that you have selected a Preferred Audience for that post. When you click on the post, you will see your usual Post Details along with a tab for Preferred Audience. When it does, you will see stats for each Interest audience. The downside from here is that to see data for link clicks, shares, and likes, you must also have 100 link shares, 100 shares, and 100 likes for the corresponding data. Once your post hits those milestones, you should receive some interesting insights into the interests of your most engaged audience.